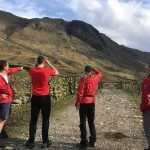 The team was called out to assist a woman with an ankle injury close to the summit of Blencathra. 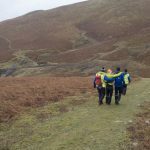 Helimed was initially tasked to assist with getting the casualty to hospital but due to cloud a decision was made to stretcher off the casualty to the Blencathra Center where the team could take her to the cottage hospital in Keswick. Once the casualty was at the hospital to receive further treatment the team then stood down.